Pricing itself slightly higher than the run-of-the-mill chain outlet, Sun with Moon promises better ingredients to those weary after a day of shopping. 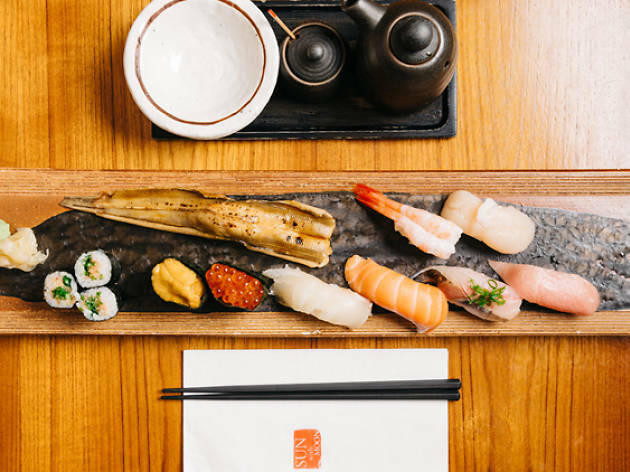 Dinner boasts more nigiri sets – five, to be exact – than lunch, including a roll-your-own sushi platter ($24.80) if DIY is your thing. 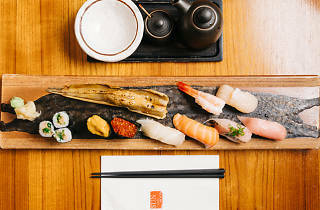 The sushi moriawase ($48.80) offers a mix of ten varieties, including a rarely found shirasu (whitebait) gunkan, which has a smooth texture and slightly bitter aftertaste. We fancy the horse mackerel – its sheen mimics its clean bright taste – and the uni. The negitoro and amaebi, while not top of their class, are also decent for their price tags.